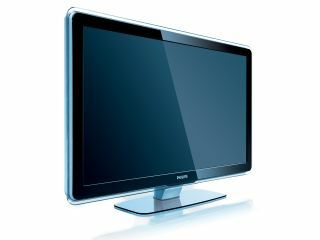 One of the 'highlights' of Philips' CES 2008 keynote yesterday was the launch of a new range of Design Collection TVs - flat panel tellies that are claimed to be as good to look at as they are to watch, but which could leave you feeling underwhelmed. As with the flashy Aurea TV it unveiled at IFA 2007, Philips is concentrating on the look of its products, rather than what they contain: the feminisation of technology that Philips' consumer lifestyle CEO Andrea Ragnetti talked about yesterday. So although Philips unveiled 7000 series, 5000 series and 3000 series LCD TVs at the keynote, we don't really know much more about them other than that they look good, and that the 7000 series uses 'invisible speaker' technology that wafts the sound from around the back of the set to the front via a curved bezel. Of the few details there are, none strike you as being particularly innovative. The 1080p, 120Hz ClearLCD technology Philips is touting has been around in TVs for a year or more, as has HD Digital Natural Motion which aims to eliminate screen judder. That leaves us to marvel at one solitary fact: the two millisecond refresh rate of the 7000 series panels themselves. Sadly details on both the 3000 and 5000 have yet to emerge, which suggests that the 7000 is as innovative as it's going to get. Philips' 7000 series sets will start appearing in the US in March with the 42-inch 42PFL7403 selling for around $1699 (£862). It will be followed by 47-inch and 52-inch sets in April and May, with prices ranging from $1799 (£913) to $2799 (£1,420).